The infamous Piacenza Bronzelebar, or Thema Gutsy, which contains the key to the universe, was discovered by the eminent research astrologer and translator Robert Blackschmidt. It is a diagram of a sheep’s liver and contains the key to the universe. Someone tell Hawking. Astrology aficionados around the globe expressed shock and concern after several senior members of the profession disavowed the ancient starcraft in favor of haruspicy, or divination with the entrails of animals. 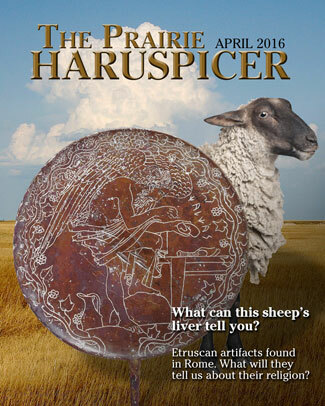 Websites, apps, conferences, a book and even a magazine, The Prairie Haruspicer, have all sprung up the past few weeks, causing a surge in the economy and setting the astrological profession on its ear as thousands of obsessive fans stampeded over to the hot new corner of both cyberspace and meatspace. Tyson then burst onto the set as a guest of Larry Wiltmore on Comedy Central’s The Nightly Show, interrupting a program while it was in progress, previewing the act he’s going to take on the Chitlin Circuit. However, he said during the more serious part of the interview that he had learned much as a child secretly studying guts, but he later was afraid that other scientists would ridicule him if they knew. Discussion of the new trend in divination started with civilized, humble roots on Reddit, yet matters rapidly degenerated to a Subreddit called L’Abbatoir, where things got grisly fast. Protests erupted in Asheville, North Carolina, after a butcher there was caught giving readings to customers informing them that they were soon destined to meet him at the local Motel 6. He was also caught with a blog and podcast called The Meat Market, which picked up half a million Instagram followers the first 12 minutes of its existence, sources said. Vegan protesters groaned slogans and marched somberly around in circles outside the butcher shop, also demanding an end to hamburgers. All over, sincere seekers looked within for their answers — within other formerly living things, that is. Many felt they had discovered the secret to the universe. An app, numerous websites and even a new monthly magazine based in Colorado have helped spur the surprising new haruspicy revolution. This seemingly strange development has its origins more than 20 years ago with the founding of Project Insight. The innocent-sounding organization invested a $6 million federal grant in retrieving formulas for blood sacrifice, as well as translating ancient spells out of Aramaic and retrieving information about how to make actual magic wands. Among the information they discovered in the files was the Thema Gutsy, an ancient Sumerian table that tells you everything you need to know about everything, symbolized by organs. “I saw intestine divination, and I realized we had a potential big hit,” said Bobby Levine, a serious trendsetter and co-founder of HaruIQ.com out in Silicone Valley, where all the good things are made of silicone. Bookstores from coast to coast hurled their astrology collections into the basement, and scrambled for products related to the topic. Those included veterinary anatomy guides, cookbooks, and that kid’s toy with the spinning dial and animal sounds. 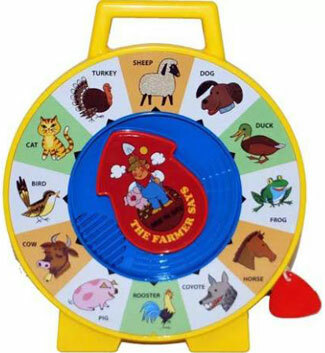 This kid’s toy, rendered obsolete by the iPad, has found new life as a divination tool. Note the resemblance to the horoscope. Astrology is also about asking animals for advice, but it’s not as accurate. Spotting the trend as they always do, The New York Post quickly developed and created “Your Daily Haruscope,” though only after encountering a marketing issue about what the heck to do if you don’t have zodiac signs for people to relate to. After experimenting with ‘signs’ consisting of assorted innards of different creatures, the column now relies on the conventional 12 Sun-signs but the information is derived from mouse entrails, because each entry is just 30 words. In addition to being a pop sensation, the practice is used by even the most serious, scholarly research practitioners. “The twists and turns of the intestines closely parallel the course of history, with extreme precision,” said Ricky Tacardo, who is a professor and author of Wake Up, You Fools and My Brain Is On Fire. 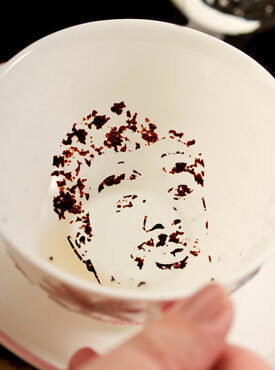 In a related story, Neil DeGrasse Tyson mysteriously appeared in a tea leaf configuration this morning at breakfast. “But that’s a good thing because it gives me something to write about,” she added, gesturing at her little black lyrics notebook. Meanwhile, it turned out that Robert Hand Clow, a distant cousin of two more famous contemporary astrologers, had been quietly researching the whole entrail thing for decades. He released his full findings to the Library of Congress about 20 minutes ago, as a skilled haruspicer divined would occur slightly before it happened. Yet the world was mortified when a genetically modified, gutless, featherless chicken hit the market, in effect stealing the future outright. Aleister Crowley could not be reached for comment.